Hundreds of whale sharks aggregate off the coast of the Yucatan Peninsula in Mexico every summer to feed on the bonito spawn. 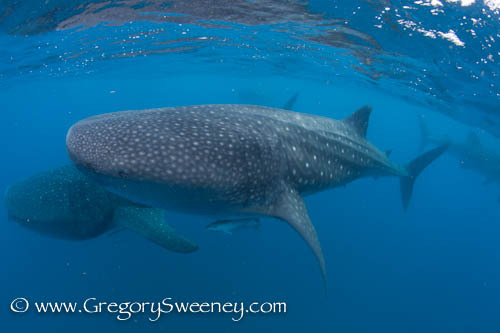 Last season was an amazing experience we had between 200 to 400 whale sharks in 1 sq km. This season we reserved private charter boats with permits at peak season to capture this incredible experience. We are only taking 6 guest / photographers per boat. Four full days in the water. Hope you can join us in warm waters of Mexico for this incredible whale shark experience.